Tom Steyer is on a multimillion-dollar mission to impeach Donald Trump, but Democrats whose campaigns the California billionaire is helping bankroll aren't keen to follow his lead. 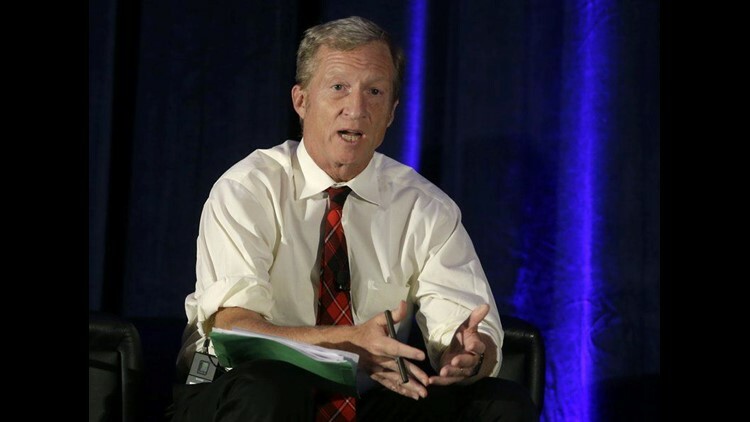 ATLANTA (AP) — Tom Steyer is on a multimillion-dollar mission to impeach Donald Trump, but Democrats whose campaigns the California billionaire is helping bankroll aren't keen to follow his lead. Steyer, whose appeals you may have seen on TV, is spending $40 million on his "Need To Impeach" roadshow, with advertising and town halls around the country. But Democratic leaders in Congress and many candidates hoping to wrest House control from the Republicans shun the prospect of showy impeachment proceedings. Instead, they're counting on pocketbook issues and a growing voter interest in checks on the GOP government in Washington. The tightrope balance for Democrats underscores their dilemma. The question is how to maximize liberal anger against the president, who is under the cloud of a special counsel's investigation, while not alienating Trump Country independents and moderate Republicans who are unhappy with him but often detest his critics even more. Steyer's largely freelancing effort is just one strain of a midterm cacophony where even tens of millions of dollars in outside spending can get lost in the noise. Trump already commands most of the attention. Republicans are eager to counterpunch. And as much as Democrats steer clear of impeachment talk, it does offer a release valve for liberal voter angst. "It is the most important issue in the United States right now," Steyer tells a crowd, nibbling on hors d'oeuvres in Atlanta before a wide-ranging discussion of "high crimes and misdemeanors" and Trump's fitness to handle nuclear launch codes. "It's about lawlessness and danger and urgency." But in sounding his impeachment alarms, the liberal, green-energy guru is also serving up an opportunity for Republicans to portray Democrats as having no agenda other than to undo the 2016 election. "I hope Steyer goes everywhere in the country and I hope he buys $100 million of ads, and I hope he insists every Democrat sign a pledge to impeach the president," says former House Speaker Newt Gingrich, who led the GOP in impeaching President Bill Clinton in 1998, only to lose seats that November. Republicans see in Steyer a chance to extend their attacks on the liberal agenda, personified by Minority Leader Nancy Pelosi, who could return to the speaker's rostrum if Democrats flip at least 24 GOP-held House seats this November. Pelosi, Steyer's fellow San Franciscan, has listened to his argument on impeachment, her office said, but does not agree. She prefers to campaign for the majority with her own cold realism. "What we're talking about is how we strengthen the financial stability of America's working families," she said recently. "That is what we are focused on." Pelosi is certainly willing to take Steyer's help for the midterm elections. Steyer and his wife, Kat, live in Pelosi's congressional district, and the couple hosted a June 2017 dinner for the Democratic Congressional Campaign Committee. The event raised $593,500, officials said, including the couple's personal contribution of $67,800. Recent polling could explain Pelosi's approach. A national survey, conducted by Marist for NPR and PBS, found 47 percent of registered voters would definitely vote against a candidate who wanted to remove Trump from office, while 42 percent said such a promise would earn their vote. That's a sobering reminder given House district lines that have been tilted to GOP advantage around the country by Republican-run state legislatures — and a 2018 Senate lineup that puts 10 Democratic incumbents up for re-election in states Trump won in 2016. Yet, in communities across America, Steyer isn't alone. One progressive leader, Rep. Raul Grijalva of Arizona, says he's routinely peppered with "When are you going to impeach him?" questions as he travels to and from his Tucson district. "These are random people, I wouldn't describe them as wild-hair progressives," said Grijalva, who's co-chair of the Congressional Progressive Caucus. "My sense is there's going to come a point, as Trump continues to devolve, that that's going to become a more persistent question: 'If you are the majority, will you begin the process to looking at impeachment?' It won't be a nuanced question, it'll be a yes-or-no question." Liberal House Democrats have forced two procedural votes on impeachment, but a December maneuver drew just 58 backers and another in January drew 66. At the same time, there have been no such votes since, and even party liberals who align generally with Steyer's aggressive activism sound more like Pelosi and the Democratic establishment on the matter. Democratic congressional hopeful Kara Eastman, running in the party's primary in Nebraska's Omaha-based 2nd District, treads carefully. "It's not a No. 1 thing," she says of impeachment. At the Working Families Party, which backs liberals in Democratic primaries around the country, spokesman Joe Dinkin says candidates who want to "stop Trumpism" should focus on beating the president and his party at the polls. That almost echoes the advice of former FBI Director James Comey, whom Trump fired last year. He told ABC News that "impeaching and removing Donald Trump from office would let the American people off the hook" from something they are "duty-bound to do directly" in the 2020 presidential election. Certainly, Trump could scramble the situation — for Democrats and Republicans alike — if he fires special counsel Robert Mueller or Deputy Attorney General Rod Rosenstein, as he did Comey last year. In fact, some Democrats say, the Mueller investigation provides a rationale for not pursuing impeachment and allowing the probe to unfold. "Folks back home get it," said Rep. Jim McGovern, D-Mass., who says he's "appalled" at Trump's presidency, but trusts Mueller's work. "We have these investigations going on for a reason - to get to the truth." And Democrats hurling "wild" accusations and impeachment cries, Gingrich says, actually "will make this election much cleaner" for Republican voters and independents on the fence. At his Atlanta town hall, Steyer — who is also spending millions of dollars on NextGen America, his effort to register young voters under 35 in key midterm races — scoffs. The 2018 election is already a referendum on the president, he argues, so face it head-on. "Rather than trying to prevent their gain, why don't we play our game?"